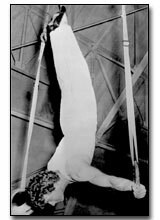 Arnold Klein is considered by many to be the greatest all-around athlete ever to participate in Southern California sports. Klein starred in football, gymnastics and track at L.A.’s Roosevelt High School. He won City championships on the rings and long horse, while excelling in the high jump and broad jump. Klein was the first All-City champion in gymnastics on all apparatus, specifi¬cally the rings, for three consecutive years. He earned a football scholarship to USC, after impressing USC's coach by scorlng four touchdowns in a high school game. But his collegiate football career was abruptly cut short by a severe injury to his knee. Nevertheless, Klein went on to win honors in international track competitions, winning gold medals in three events in 1953 at the World Maccabiah Games in Israel--the high jump, long jump and standing broad jump. In 1964 at Petaluma, California, Klein won the heavyweight division at the World's Arm Wrestling Championships.